The reasons for Generation X’s poorer prospects are due to long-term trends like the rise of 401(k)s and less generous Social Security benefits for future generations. But first, an explanation of the Center’s analysis. The Center’s economists, using 2010 data from the Federal Reserve Board’s Survey of Consumer Finances, estimate how much retirement income a U.S. worker is expected to receive from sources such as 401(k) savings, Social Security benefits, employer pensions, and any income he can tap from his home equity. The total retirement income is then calculated as a percent of his income during his working years. A second estimate is how much a U.S. worker will actually need in retirement – the target income that would allow him to maintain the same standard of living as when he was working. The target, which takes into account that retirees spend less on taxes, savings, and house payments, is also calculated as a percent of pre-retirement income. These two percentages – what workers are on track to have, and what they will need – are then compared. If a retiree’s income replacement rate falls more than 10 percent below the target, he’s at risk. Generation X will feel the full impact of the decline of corporate defined-benefit plans, which still dominated when boomers were new to the labor force. These plans, which guaranteed a check every month, have largely been replaced with 401(k)s, which in practice are generating less income for retirees than traditional plans. A second reason has to do with Social Security. Benefits from the program are becoming less generous over time, because the age at which a worker can receive his full benefit will rise for future generations. Social Security’s Full Retirement Age is 67 for Generation X, compared with 66 for their boomer parents. A third impact on Generation X is longevity. Everyone wants to live longer, but it’s expensive. 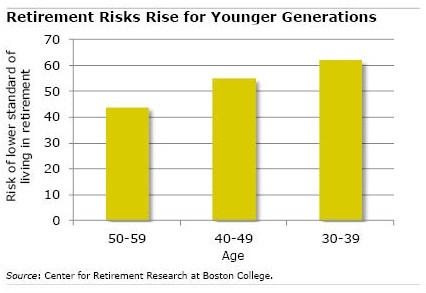 Young adults will need larger 401(k)s balances to fund a longer period in retirement. The upshot: unless 30- and 40-somethings start saving more and making plans to work longer, they’ll be unable to maintain the lifestyle to which they are growing accustomed. My parents (in their 80s) had all those pension benefits you mention. My wife and I (in our 50s) have some pension benefits, plus 401(k), IRA, and outside stock market investments (which make up the majority of our retirement income and for which we had to study up for in order to invest successfully). The problem I see is that these 30/40-somethings aren’t gaining the knowledge to successfully take advantage of fantastic opportunities in the stock market to manage their own investments for their retirement. The challenge for boomer children is to have the discipline to save for retirement through all the means available. Another challenge is to make up for years of lost wages and savings during the downturn. You cannot take advantage of fantastic opportunities unless you have savings, discipline, and steady income. From my vantage point as a public employee with a defined benefit pension, it is easy to see the intergenerational problem. The retirement pie is constantly shrinking as one generation takes what it believes to be its “fair” share, then leaves a smaller pie for the next generation. This process leads to serial pension fixes that give decreased benefits to the succeeding generations of workers. Those that lament the disappearance of the DB pension must realize that the DC pension is the natural endpoint when normal human greed and self-interest factor into retirement policy. The DC pension at least gives the worker ownership of his retirement savings, albeit with all the attendant risks. It also stops the current generation from unilaterally pushing financial sacrifices on to future generations. They don’t need to save more. They need to vote more. Where’s the political activism in a generation that is getting completely screwed? Beats me.